Look Ma - no mains! 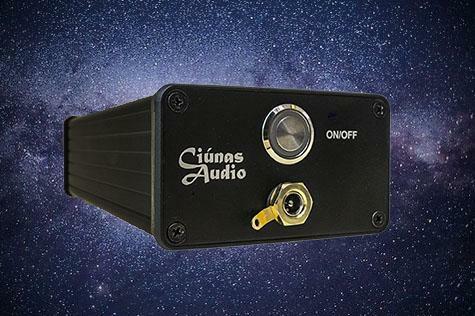 John Kenny, these days trading as Ciúnas Audio, has built up a deserved reputation for producing high quality battery-operated DACs, and other USB equipment. 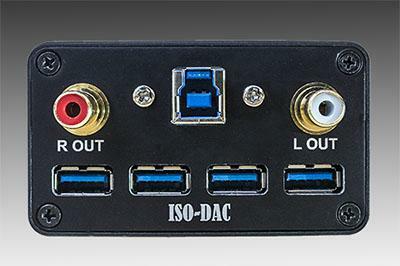 This review will look at one of the latest products, the ISO-DAC. Like its predecessors, the ISO-DAC is battery operated, but what makes it stand out from the crowd, is that it is isolated, and can also operate as an ISO-HUB (to isolate other USB equipment). The ISO-DAC is housed in a slightly elongated extruded aluminium case. Located on the front panel is a press-button on/off switch that lights up blue when the power is on. Below that is the jack socket where the power supply is connected for recharging. The rear panel is more densely populated, because apart from the expected USB input socket, and the twin phono sockets for analogue output, we find the four USB sockets that facilitate connection of the ISO-HUB functions. The ISO-DAC can be operated while it is being charged, and this appears to make no difference to the sound quality. There is a tab on the voltage input socket that can be connected to mains ground (or amplifier ground) which may improve the sound in the event of current leakage. To date, John Kenny had not found a situation where this made a difference, but the tab is there just in case, as systems differ. "USB sends data in packets, not a continuous flow. Inside the receiving device, the packet data is continually stored in a small buffer & converted to a continuous stream by using the local clock to time the data out of the buffer (it's this timing that is critical & the advantage that asynch provides - the timing out of this data is done from the clock in the audio device rather than a clock derived from the PC's USB packet stream). Asynch tells the computer how much data to send in each USB packet in order to keep the buffer about half full. All USB hubs do the same as the above - they are simply an intermediate station along the way between computer & final USB device However, in this case, it is being used to receive USB packets & at the same time isolate/eliminate any noise on the data signal lines (D+ & D-) as well as the ground or 5V line - this is the isolation part. It also allows, by using ultra low noise & stable battery power, to provide a clean & optimally formed USB signal as output for transmission to the final USB audio device. This is what an ISO-HUB does as a stand-alone device. That same technology is incorporated into my ISO-DAC & ISO-SPDIF thus avoiding the cables, different PS, etc. These are the first DACs & SPDIF converters that has incorporated such technology. Other DACs may say they have galvanic isolation but this is only a band aid partial solution as it doesn't isolate & clean the incoming USB signal - it isolates after the USB receiver - it's a case of the horse has already bolted." So how does the ISO-DAC actually sound, and does the isolation part work in practice? The answer is that is sounds awesome! I connected the ISO-DAC via a iFi Gemini USB cable, into a PC running Euphony. Output from the DAC was directly to a Clef Audio Soloist amplifier via Vertex-Audio interconnects. There is no waiting to detect the sonic qualities of this DAC, it is apparent as soon as you start listening. It has a very strong presentation, but is never 'shouty'. I would describe the balance of presentation as very slightly to the darker side. The bass is certainly very strong, but well controlled, tight, and tuneful. The mid-range is smooth, and the top end lacking any signs of glare. What I also noticed from the start, well actually at the ends of tracks, was where they faded out, I could very clearly here the detail until it was actually gone. More so than I have done in the past. And of course this also showed in the whole track with every tiny part of the music clearly audible. I could describe the ISO-DAC as a sonic magnifying glass, teasing out every little bit of detail from the recording. All this came from an inky black background which increased the 'presence' in the music. Every part of the performance of the ISO-DAC is highly satisfactory, the timing, the musicality, the sound-stage, and imaging, making for a very pleasant, and engaging listening experience. I have in the past expressed my preference for (good) mains powered USB DACs over those using battery power. I can honestly say that with the ISO-DAC, I did not notice the very slight lack of dynamics that I have experienced with battery-powered equipment in the past. So it appears to have all the advantages of battery power, with none of the disadvantages. It is becoming increasingly difficult to write reviews about this type of equipment because it is getting so good now that it is hard to find any criticisms. All I can really write about the ISO-DAC is about how good it sounded. When I went to audition it for say an hour, I found myself making excuses to continue the session well after I intended to. It was one of those review items that made me want to re-explore my music collection. In short, the ISO-DAC is probably the most impressive sounding USB DAC that I have heard to date. Now, coming to the ISO-HUB features of the ISO-DAC, I am not quite so rapturous. Not because they don't work, but because I have a hard time understanding their raison d'être on the ISO-DAC. I mentioned this to John Kenny who told me that his PCBs all have the isolation circuitry built in, and he therefore utilizes it in items such as the ISO-DAC. The benefits of isolation can be used for connecting something like a USB stick or hard drive to the system in order to play back music from that device. Or another DAC can be connected to the system through the isolation hub on the ISO-DAC. But I ask myself, if I owned the ISO-DAC, what other DAC would I prefer to use in its place? Also, I have found that the optimal computer playback system plays back music from an internal SSD. If I was using an ISO-DAC, I would want to use that optimised arrangement, not connect an external music drive via the hub. Of course, some people do have their music on an external drive, and will no doubt benefit from the isolation provided, by connecting that drive via the ISO-DAC. So if you use an external music drive, the ISO DAC is an even more attractive option. This isn't a criticism as such, but the ISO-HUB features of the ISO-DAC should perhaps be seen as a bonus item that the user may find useful, rather than a must-have feature. In other words the ISO-DAC is good enough as a USB DAC to warrant its purchase, with or without, the additional isolation hub features. As I said, it is difficult to say much more about such an excellent piece of hi-fi. Once again, I am left wondering how much more performance can be extracted from these computer audio playback devices. I felt that the early USB DACs sounded as good as a mid-range turntable. Now DACs like the ISO-DAC have (IMHO) equaled, or maybe surpassed the best turntables, and without the disadvantage of dealing with the clicks and pops of vinyl. So, with or without, the isolating hub function, I very strongly recommend the ISO-DAC, and thanks to Ciúnas Audio's 'home trial' policy, you can try one yourself for 30 days and then return it if you don't want to keep it. So, if you are looking for a USB DAC, or want to upgrade, I highly recommend the ISO-DAC!